Independent vinyl pressing plant, located in London, UK. Incorporated in August 1978 as Pierkarn Ltd. (as a music broker) by Nicholas Charles Flower, Jeffrey Trendell and engineer Ronald William Havell. 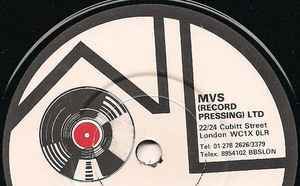 Renamed to MVS (Record Pressing) Ltd. in January 1981 (incorporated in February 1981). MVS stands for Music and Video Services. Factory Records granted a £10.000 shares stake in the manufacturer, allowing to buy the assets from Samea Records (Pressing) Limited in 1982. The company now had 3 Toolex Alpha 702 7" automatic presses and 3 Toolex Alpha AD 1202 12" automatic presses. The manufacturing was relocated to Cubitt Street in November 1982. Went into voluntary creditor's winding up in November 1984 following the collapse of Ronco and two other major customers. Can be identified by its vinyl inscriptions MVS or MVSS, found on many Mute and Factory releases. Also existing was MVS (Cassette Duplication) Ltd., incorporated in February 1983, after taking over Echoshire Ltd., to duplicate videos.